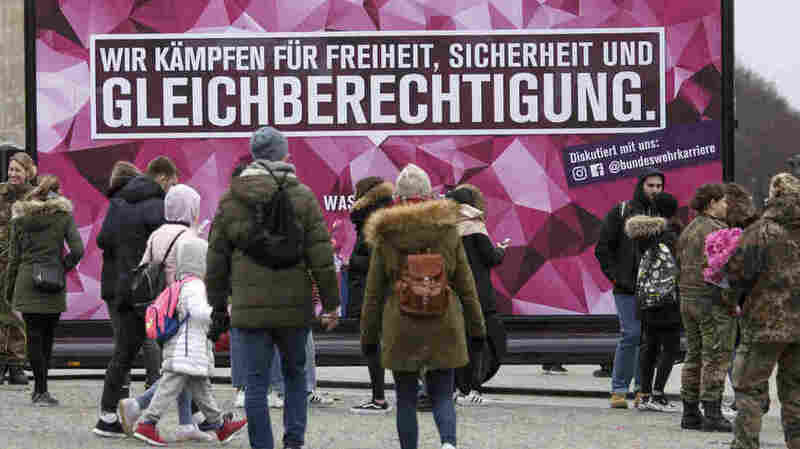 Berlin Marks International Women's Day As A Public Holiday For The First Time Residents of Berlin are off work after the region's government made March 8 a public holiday. International Women's Day goes back to German rights advocate Clara Zetkin. People pass a banner that reads: "We fight for freedom, security and equal rights" in front of the Brandenburg Gate on Friday in Berlin. Millions of Germans will for the first time join citizens of more than 20 countries in celebrating International Women's Day as a public holiday Friday. March 8 is now a public holiday in the city-state of Berlin after its parliament approved the change in January. The date is already an official holiday in Russia and Cuba as well as parts of Eastern Europe, Southeast Asia and Africa. This year marks the first time that most people in Berlin, Germany's capital and most populous city, will have the day off of work in celebration. The designation as an official holiday means "fighting for gender equality and women's rights," Berlin Governing Mayor Michael Müller said. He noted that women make up 55 percent of Berlin's Senate but said the number of women in Berlin's House of Representatives had fallen recently. Müller said equal pay for equal work has still not been achieved, adding that there is a 23 percent difference between men's and women's salaries. Access to the labor market and child care are other issues of importance, particularly for single mothers, he said. International Women's Day has history dating to 1909, when National Woman's Day was observed on Feb. 28 in the U.S., according to the United Nations. The Socialist Party of America designated the date after thousands of women marched for better working conditions and higher pay in New York City in 1908. But the holiday's international focus involves a German woman, Clara Zetkin. Zetkin, a Marxist theorist and women's rights activist, proposed the idea at an international socialist women's conference in Copenhagen in 1910, according to Deutsche Welle. The next year, Austria, Denmark, Germany and Switzerland marked International Women's Day on March 19 with rallies. Women demanded the right to vote, right to work, vocational training and the end of discrimination in the workplace. German women gained the right to vote in 1918. In 1975, the United Nations began celebrating International Women's Day, which had by then moved to March 8. "We're in the 100th year of women's suffrage but we still have a lot to do," German Family and Women's Minister Franziska Giffey told DW Thursday. "We need to ensure that women can not only be active in leadership positions, but in every profession. We have to make sure that social professions are valued. We have to make sure that more is done against domestic violence, especially against women." Thousands are expected to take to the streets in Berlin Friday with the slogan: "Celebrate, strike, fight on," according to DW. Organizers reportedly plan to protest against poverty and unpaid labor that often falls upon women. Berlin is the first of Germany's 16 states to make International Women's Day a public holiday.